A very modern late-season plum, developed in the UK. 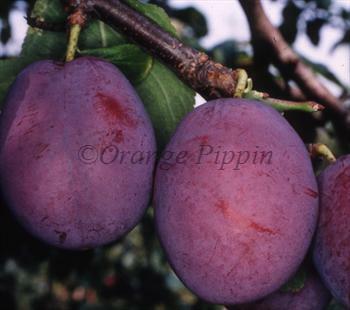 Guinevere is a large puple / black plum, similar to Marjories Seedling, but primarily a dessert plum. Unusually for a European plum, Guinevere stores quite well if kept refrigerated. Please fill in the details below and we will let you know when Guinevere plum trees are back in stock. Another useful late-season plum, better for cooking than Guinevere. keeps very well for a plum? Guinevere is in flowering group 3. Guinevere is self-fertile and does not need a pollination partner, although fruiting may be improved if there is a compatible tree of a different variety nearby. Since it flowers in the middle of the blossom season it can be pollinated by most other plum trees. Guinevere is a very new variety and we welcome feedback on its performance in different growing conditions. However it seems to be a compact and well-shaped tree, which comes into bearing relatively early in the life of the tree, and appears to be self-fertile. (Most European plums come into bearing after about 4 years on the St. Julien A rootstock). Developed in Kent, UK, released for sale in 2000.